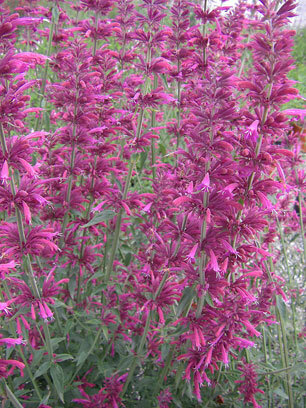 Agastache cana hybrid with aromatic green leaves puts up strong flower stems to 3-4 feet in summer. Red violet buds open into rich carmine flowers in dense spikes. Attractive to hummingbirds. Suncrest Nurseries selection.